this week’s penny black saturday challenge is to include zig zags or triangles on your project, so this is my interpretation. the image is watercoloured, the star cut out and popped and i added peel off dots to the tree. the red looks more orange in the photo. thanks for popping by. You’re amazing! If I were to read that challenge, I would never have thought to use a dp w/trees in it. Hello. That’s the difference between you and I ~ you have vision, girl. Your image is precious. those are difinitely perfect images for you! I see you’ve been featured 3x’s in flutterby wednesay and you won week 121 PB. Yikes, you’re moving and shaking up the stamping world. Your card is adorable! Very cute. Awesome use of the red dots! Ohh Linda! !That’s just too cute!! Is that a new Hedgie – or a new clear one? I might need to get him!! So cute -and just brilliant with the red dots! Love it!! Cute, cute, cute! I love this card. 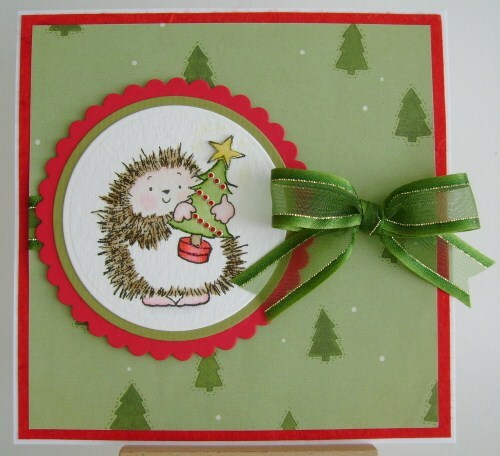 That hedgie is adorable and I love the little red dots you’ve added to the tree.